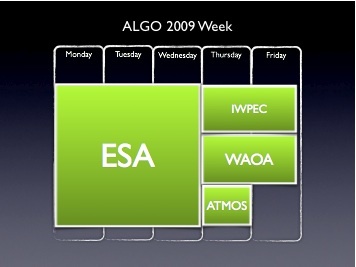 This is part 1 in a series of 3 posts on ALGO 2009, largely repeating the organiser’s report from the business meeting. 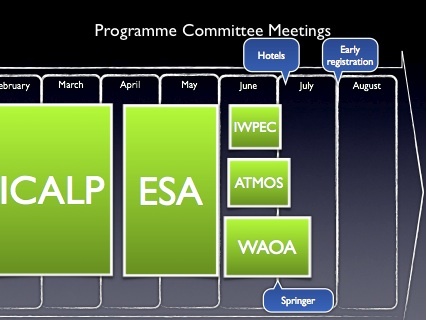 Without WABI, the ESA conference has the first three days to itself – an alternative would have been to give three full days to IWPEC and let it overlap, at least partially. Given the IWPEC submissions that might have been a better idea. More critical is the situation before the conference proper, when all the various PCs have to coördinate their activities. It has been decided that ESA waits for ICALP’s decisions, so with Springer’s deadline for conference production, the available time slots are pretty tight. For the organiser this means that the deadline for early registration has to be pretty late, which makes it hard to produce a realistic final budget. Also, we were unable to hold hotel rooms longer than the first week of July, which was before WAOA’s notification. This turned out to be no problem, hotel rooms were still plentiful. Still, all the PCs had to work under very tight conditions. Moving the ICALP PC meeting to the left a bit, and possibly moving the ALGO conference date farther into mid- or late September would remedy this. One of our early decisions was to view ALGO as a monolithic, five-day event, rather than a smörgåsbord of workshops and events for which to register (and get billed) separately. This is a hard decision that has many consequences for organisation, financing, dealing with PCs, etc. Student registration covers social events. The social events are an important part of the conference, in particular for students. Therefore, I’m never really happy with conferences where student registration does not cover the joint dinner or the social events. Many institutions make it much harder to get reimbursement for a dinner ticket than an exorbitant conference fee. Thus, we slightly under-priced participation for students, and slightly over-priced participation for regular attendees. 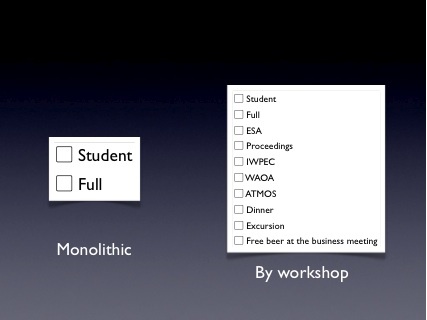 No separate workshop registration. ALGO 2009 participants paid the same, whether they stayed for five days including all social events, or whether they just popped by for their own talk and left the same day. This made it attractive to stay for more days, which is what we want, but probably also prevented some people from attending. In the end, I think we made the right decision. We had lots of attendees, and many stayed for many days. However, the ATMOS workshop is probably hurt by this: it’s a 1-day event, even trying to attract relevant industry, and the full ALGO participation fee is just too high for that. In hindsight, I believe a separate “1-day, no fun”-registration, for exactly half the price of the full ALGO registration, is the proper way to go. We decided early on to have ALGO at the university, during the semester. I like this a lot better than using a dedicated conference venue or a hotel; the atmosphere is nicer, and we’re sending important signals in both directions. The possible downside is that ALGO 2009 was crowded (which I like), and that we had to make some compromises with respect to lecture rooms that would otherwise not have been an issue. This entry was posted in Conferences on September 18, 2009 by thorehusfeldt.